We Service ALL BRANDS of Commercial Overhead Garage Doors and Commercial Garage Door Openers! Garage Door Experts of Philadelphia sells General Garage Doors as its primary Commercial garage door manufacturer. However, if you need Commercial garage door service, repair, commercial opener repair or replacement or even a monthly maintenance program, Garage Door Experts of Philadelphia can assist you with all of your commercial garage door needs! Call us today and speak to a commercial garage door expert! 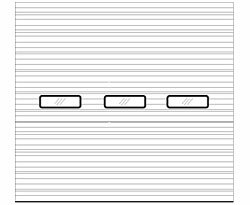 General Doors Corp. has been manufacturing sectional overhead doors since 1947. Originally, the product lines were entirely wood doors, but we added commercial steel doors in the 1970's and residential steel doors in the 1980's. The 1990's brought development of a network of distribution and sub-manufacturing facilities to serve the East and Northeast parts of the country. The current decade has brought a continued expansion of manufacturing and distribution space, and the development of wood and steel carriage style doors. We are one of the few door companies that still makes a full line of wood doors and that still manufactures our own track and hardware. General’s standard commercial door is a pan-type product, 2-1/8” thick, made with 24 gauge G-60 hot-dipped galvanized steel skin and heavy duty galvanized stiles welded to the skin on each side. It is available in a white or bronze color. This door can also be ordered with a 20 gauge skin (white only) for extra heavy duty applications. G-60 galvanizing over full 24 gauge steel and heavy duty paint system welded to heavy galvanized stiles. Available with cut-out lites or with full view aluminum frame section in mill finish or painted white or bronze to match door color. Pass door available cut into a 20 gauge door, but parent door is limited to width of 12’ to maintain structural integrity. Double contact rubber bottom seal. General’s insulated pan-type door is 2-1/8” thick, made with 24 gauge G-60 hot-dipped galvanized steel skin and heavy duty galvanized stiles welded to the skin on each side. Polystyrene insulation 1-7/16” thick is installed and covered with 26 gauge white painted steel or a heavy vinyl backer sheet. It is available in a white or bronze color. This door can also be ordered with a 20 gauge skin (white only) for extra heavy duty applications. Available with cut-out lites or with full view aluminum frame section in mill finish or painted white or bronze to match door color. Insulated or single glazed lites are available. 1-7/16” polystyrene insulation is installed and covered with either 26 gauge white painted steel or a .040” thick impact resistant vinyl backer sheet. General’s Weather-Breaker Door is 1-3/4” thick, constructed of polyurethane foam injected between two G-60 hot-dipped galvanized steel skins. This is a super-insulated door with an R-value of 16.4. It is available in white or brown. This is an obvious choice if energy conservation is a foremost concern, but the Weather-Breaker’s sturdy, solid construction makes it a good choice in a wide variety of applications. State-of –the-art manufacturing process produces a super-strong, super-insulated (R value = 16.4) section using CFC 11 free polyurethane foam core. Embossed pin stripe ribs in 25 gauge exterior skin, and embossed 27 Gauge interior skin are separated by a thermal break. Available with cut-out lites or with full view aluminum frame section in mill finish or painted white or brown to match door color. All cut-out lites are with insulated glass, full view sections have many glass options. 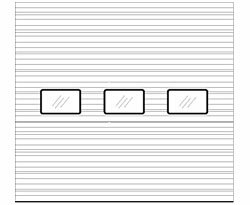 A 3-1/2 section high Pass Door is available, but parent door is limited to width of 12’ to maintain structural integrity. These doors are made in a traditional stile and rail construction method, using 1-3/4” thick select grade finger-joint Hem/Fir lumber and your choice of 1/4”hardboard, 1/4” plywood, or 3/8” thick MDO plywood panels. Glass can also be installed in any panel. This is a durable door with a rustic look and great design flexibility. Door sections will measure a full 1-3/4” thick, constructed of west coast Hemlock, Douglas Fir or equal. All joints utilize mortise and tenon construction and are glued with waterproof glue and steel pinned while under pressure. Sections are sanded and feature rabbeted weathertight section joints. 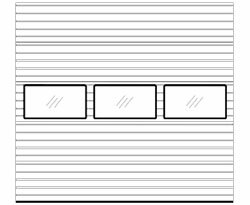 Wood dimensions are: bottom rail is 5-1/4” (7-1/4” if door is over 16’2 wide), top rail is 5-1/4”, end stiles are 5-3/16”, center stiles are 3-1/4” and meeting rails are 4-3/4” combined. Standard panels are ¼” high-grade hardboard. Optional factory priming is available. Several models of steel doors originally designed for the residential market are of sufficiently heavy duty construction to be used in conjunction with heavy duty track and hardware and used in commercial applications. Typically these might be used on fire houses or in businesses seeking an attractive appearance. General’s Advantage door is a three layer product, made with a 1-3/8” thick polystyrene core sandwiched between two 26-gauge pre-finished steel skins. The steel is protected by a G60 galvanizing layer topped by a heavy duty two-coat baked–on polyester paint system. The rated R-value is 6.3 and the door is available in four colors: White, Almond, Brown, and Sandstone. 1-3/8” thick polystyrene insulation bonded between two 26 Gauge steel skins separated by a thermal break, yielding an R-value of 6.6. Authentic wood-grain detail and a deep, well-defined raised panel design that is sized and spaced in a way that is proportional to the door size. Also available flush. Durable two-coat, baked-on polyester finish on top of G-60 hot-dipped galvanized steel, inside and out. Full selection of window options, including insulated glass, each frame and insert painted to match door and minimize fading. Double tongue-in groove design forms a very tight section joint. 1-3/4” thick polyurethane foam injected between two 26 Gauge steel skins separated by a thermal break, yielding an R-value of 16, the highest available. Available in a standard Colonial or a Ranch (Long Panel) raised panel design. Also available flush. 3/8” deep ship lap joint with dual seal between the sections.